Among 158 exercises analyzed in a July 2004 "Harvard Heart Letter" report, bicycling more than 20 mph tied for the number one weight-loss exercise with running at 10 mph. Bicycling at other speeds also ranks high in “calories burned” studies. Bicycling is also one of the best exercises for improving your health and fitness, according to exercise expert Dr. Kenneth Cooper. How many calories you burn bicycling depends on your speed, time, distance, effort and weight. Bicycling more than 20 mph burns 1,228 calories per hour if you weigh 155 pounds and 1,466 calories per hour if you're 185 pounds, according to the "Harvard Heart Letter" report. Bicycling slower burns fewer calories because it requires less effort. Exerting more effort increases your heart rate. Higher heart rates require more oxygen. Oxygen burns calories. Bicycling 14 to 15.9 mph burns 744 calories per hour, and bicycling 12 to 13.9 mph burns 596 calories per hour. 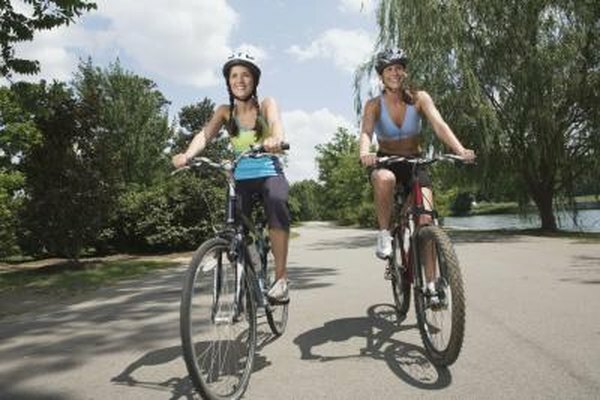 Leisurely bicycling, which is bicycling less than 10 mph, burns 280 calories per hour, according to Wisconsin's Department of Health and Family Services. The American College of Sports Medicine recommends three to five 20- to 60-minute aerobic workouts weekly. Aerobic workouts include bicycling, jogging, swimming and walking. If you weigh 155 pounds and bicycle more than 20 mph two hours weekly, you will burn 2,456 calories, or about two-thirds of a pound weekly, because 3,500 calories equals 1 pound. People who weigh 155 pounds and bicycle two hours weekly will burn 1,488 calories bicycling 14 to 15.9 mph, 1,192 calories bicycling 12 to 13.9 mph, and 560 calories bicycling leisurely. People who weigh 155 pounds and bicycle four hours weekly will burn 4,912 calories bicycling more than 20 mph, 2,976 calories at 14 to 15.9 mph, 2,384 calories at 12 to 13.9 mph, and 1,120 calories bicycling leisurely. If you weigh 155 pounds, bicycling 20 mph burns about 61 calories per mile, 15 mph about 49.5 calories per mile, 13 mph about 46 calories per mile, and 8 mph about 28 calories per mile. Consequently, bicycling five miles burns about 305 calories if you bicycle 20 mph, about 248 calories at 15 mph, about 230 calories at 13 mph, and about 140 calories at 8 mph. Bicycling 10 miles burns about 610 calories if you bicycle 20 mph, about 495 calories at 15 mph, about 460 calories at 13 mph, and about 280 calories at 8 mph. Eating more calories provides you the energy for exercise. Eating too little could reduce your speed and increase your risk of injury. If you weigh 155 pounds, you should eat 456 extra calories on the day that you want to bicycle 15 mph for one hour, and 419 extra calories if you’re bicycling 13 mph for one hour. You need to eat mostly carbohydrates for exercises of up to one hour, but need to eat more fat and protein if your workouts are longer, according to “Swim, Bike, Run” authors Glenn Town and Todd Kearney.